The METACONCEPT Group offers a wide range of products designed for the jewellery and silverware markets. Besides alloys for casting, centrifugal casting equipment and silicones for manufacturing, we also offer enamels used for decorative purposes in arts and crafts work as well as the materials necessary for applying decorative resins to your chosen base. 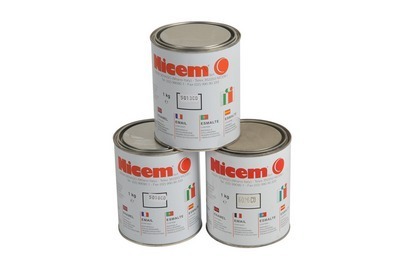 Decorative resin (epoxy) is a bi-composite enamel + catalyst (hardener). For all enamels, we recommend using a furnace for curing (hardening of the enamel) to prevent warping. After hardening in the furnace, the enamels must remain at room temperature for 24 hours. All enamels, except for the 9005 TR FLEX, can be mixed together. We recommend mixing only the minimum required quantities to prevent waste. Storage period: 12 months in dry conditions away from direct sunlight. Have you defined the type of application? Contact us. Our technical staff will be happy to assist you in choosing which equipment and materials to use. resin application With or without accessories The heated table has been designed to ensure a very precise application of resins and good productivity. Heated plate With or without distributor For special conditions (limited space, sampling), we offer a heated plate with a small manual distributor (500 x 500 mm). This economical solution offers all technical production features. Resin distributor Manual or automatic The components of this machine have been designed to simplify the application of resins, glues and solder pastes on complex-shaped objects. A wide range of interchangeable syringes are available for all types of applications. Resin distributor Automatic, drip-free version The components of this machine have been designed to simplify the application of resins, glues and solder pastes on complex-shaped objects. A wide range of interchangeable syringes are available for all types of applications. filtration system 220 V – 50 or 60 Hz with 3 suction nozzles Used to filter vapours produced by the FOS 200 furnace and the resin application table. Cylinder, syringe and adaptor 10 cc – 30 cc – 60 cc Depending on the application. 0,9 – 1,1 – 1,2 – 1,6 mm Depending on the application. These decorative resins are mainly used in ornamental and artistic applications on metallic (gold, silver, etc.) and non- metallic objects (crystals, glasses, plastic, wood and diamante). Their aesthetic and mechanical properties impart a very high quality to the treated enamels in terms of the brightness of the colours, resistance to abrasion and elasticity. The implementation process is specific to the characteristics of the part being produced, Contact the METACONCEPT Group’s technical department who will advise which enamels to choose.